Security is very important in order to save your network being hacked, though you would need physical security to your devices as well but passwords are absolutely the best defense against would-be hackers. Before starting this lab I would suggest you to read “Different modes and prompts of acisco router ios” where you can find a complete drill down of cisco routers ios prompts and modes being used in this lab, which could also help you understand upcoming labs easily. Cisco router’s has some defense against would-be hackers built into its internetworking operating system (IOS). for example it is impossible to telnet into a cisco router unless an administrator configures a telnet password or uses the No Login Command which allows users to telnet router without any password. and also you won’t be able to get into privileged mode from telnet unless the enable password is set. Five passwords are being used in order to secure a cisco router: Consol, auxiliary, telnet (VTY), enable password and enable secret. The enable secret and enable password are used to secure the privileged mode. The other three are used when a user wants to get into user mode through the Consol port, through the auxiliary port or via telnet. To set the enable password you should get into global configuration mode using the following command. Once you get into global configuration mode you can set enable password using enable password [your password] command. 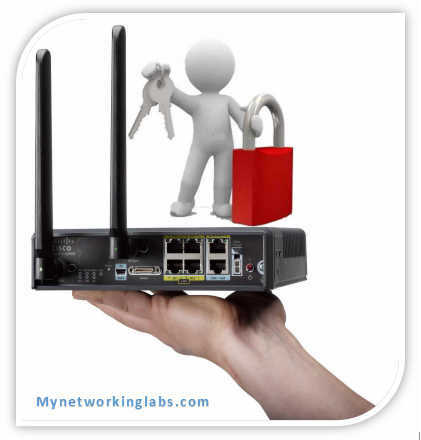 In above lab we set enable password to be the same “mynetworkinglabs” as it was before, and enable secret to be “waleed”. If you try to set the enable secret and enable password the same then router will give you a nice and polite prompt asking you to change the second password. If you don’t have the older legacy routers so don’t even bother to use the enable password. When entering the privileged mode router will first ask you to write the enable password and then the enable secret. Notice the prompt changes from Router(config)# to Router(config-line)# which tells you that you are configuring the Console, Aux or VTY line. You can use two more commands to finish configuring the console user-mode password. Login: This tells router to look under console line configuration for password. If you do not use this command router will not prompt you for password while connecting to router’s console port. Password: This sets the password for console user-mode. It is case sensitive. The Virtual Teletype (VTY) lines are used to configure Telnet access to a Cisco router. As I mentioned earlier, the VTY lines must be configured for Telnet to be successful. This is the default on every Cisco router. to determine the number of lines available on your router. The number varies with the type of router and the IOS version. However, five is the most common number of lines. Notice that you choose all the lines available for the most efficient configuration. You can set each line individually, but because you cannot choose the line you enter the router with when you Telnet, this can cause problems. The Line command passwords (console, aux, and VTY) are not encrypted by default and can be seen by going into privileged EXEC mode and typing the command show running-config. This “show running-config” displays the complete configuration that the router is running, including all the passwords. Remember that the Enable Secret password is encrypted by default, but the other four are not. To encrypt your passwords, use the global configuration command service password-encryption. All of the passwords can be the same except the Enable Password and the Enable Secret passwords. You should make them different for security reasons, however. It is extremely important to set your passwords on every Cisco router your company has. If you are studying for your Cisco certification exams, be sure you understand the passwords and how to set them. Remember the difference between the Enable Secret and the Enable password and that the Enable Secret password supercedes the Enable password if it’s set. I have taken care in preparation of the content contained herein but make no expressed or implied warranty of any kind and assume no responsibility for errors or omissions. No liability is assumed for any damages. Always have a verified backup before making any changes.